The Buenos Aires Pastoral Region (Argentina), where Cardinal Bergoglio used to work, encompasses the city of Buenos Aires and nearby cities, with a population of more than 13 million inhabitants. The Region is made up by more than 20 Bishops. Recently, they have sent their priests a document explaining their criteria on the potential access to sacraments of “the divorced who have entered a new union”. What makes this message particularly interesting is that it was sent to Pope Francis, who answered it with a letter stating that “the document is very good and thoroughly specifies the meaning of chapter VIII of Amoris laetitia. There are no further interpretations”. Therefore, the Bishops’ letter makes it possible to unambiguously recognize the correct interpretation of the papal document regarding the true scope of chapter VIII. The Pope also asked the Bishops to help disseminate the entire document, which is an invitation to consolidate marriages. we have received with joy the exhortation Amoris laetitia, which invites us, above all, to encourage the growth of love between spouses and to motivate the youth to opt for marriage and a family. These are important issues that should never be disregarded or overshadowed by other matters. Francis has opened several doors in pastoral care for families and we are invited to leverage this time of mercy with a view to endorsing, as a pilgrim Church, the richness offered by the different chapters of this Apostolic Exhortation. We will now focus on chapter VIII, since it refers to the “guidelines of the bishop” (300) in order to discern on the potential access to sacraments of the “divorced who have entered a new union”. We deem it convenient, as Bishops of the same Pastoral Region, to agree on some basic criteria. We present them without prejudice to the authority that each Bishop has over his own Diocese to clarify, complete or restrict them. 1) Firstly, we should remember that it is not advisable to speak of “permissions” to have access to sacraments, but of a discernment process in the company of a pastor. It is a “personal and pastoral discernment” (300). 2) In this path, the pastor should emphasize the fundamental proclamation, the kerygma, so as to foster or renew a personal encounter with the living Christ (cf. 58). 3) Pastoral accompaniment is an exercise of the “via caritatis”. It is an invitation to follow “the way of Jesus, the way of mercy and reinstatement” (296). This itinerary requires the pastoral charity of the priest who receives the penitent, listens to him/her attentively and shows him/her the maternal face of the Church, while also accepting his/her righteous intention and good purpose to devote his/her whole life to the light of the Gospel and to practise charity (cf. 306). 5) Whenever feasible depending on the specific circumstances of a couple, especially when both partners are Christians walking the path of faith, a proposal may be made to resolve to live in continence. Amoris laetitia does not ignore the difficulties arising from this option (cf. footnote 329) and offers the possibility of having access to the sacrament of Reconciliation if the partners fail in this purpose (cf. footnote 364, recalling the teaching that Saint John Paul II sent to Cardinal W. Baum, dated 22 March, 1996). 6) In more complex cases, and when a declaration of nullity has not been obtained, the above mentioned option may not, in fact, be feasible. Nonetheless, a path of discernment is still possible. If it is acknowledged that, in a concrete case, there are limitations that mitigate responsibility and culpability (cf. 301-302), especially when a person believes he/she would incur a subsequent fault by harming the children of the new union, Amoris laetitia offers the possibility of having access to the sacraments of Reconciliation and Eucharist (cf. footnotes 336 and 351). These sacraments, in turn, prepare the person to continue maturing and growing with the power of grace. 7) However, it should not be understood that this possibility implies unlimited access to sacraments, or that all situations warrant such unlimited access. The proposal is to properly discern each case. For example, special care should be taken of “a new union arising from a recent divorce” or “the case of someone who has consistently failed in his obligations to the family” (298). Also, when there is a sort of apology or ostentation of the person’s situation “as if it were part of the Christian ideal” (297). In these difficult cases, we should be patient companions, and seek a path of reinstatement (cf. 297, 299). 8) It is always important to guide people to stand before God with their conscience. A useful tool to do this is the “examination of con­science” proposed by Amoris laetitia 300, specifically in relation to “how did they act towards their children” or the abandoned partner. Where there have been unresolved injustices, providing access to sacraments is particularly outrageous. 9) It may be convenient for an eventual access to sacraments to take place in a discreet manner, especially if troublesome situations can be anticipated. At the same time, however, the community should be accompanied so that it may grow in its spirit of understanding and acceptance, without letting this situation create confusion about the teaching of the Church on the indissoluble marriage. The community is an instrument of mercy, which is “unmerited, unconditional and gratuitous” (297). 10) Discernment is not closed, because it “is dynamic; it must remain ever open to new stages of growth and to new decisions which can ena­ble the ideal to be more fully realized” (303), according to the “law of gradualness” (295) and with confidence in the help of grace. Above all, we are pastors. This is why we would like to welcome the following words of the Pope: “I also encourage the Church’s pastors to listen [to the faithful] with sensitivity and seren­ity, with a sincere desire to understand their plight and their point of view, in order to help them live better lives and to recognize their proper place in the Church” (312). 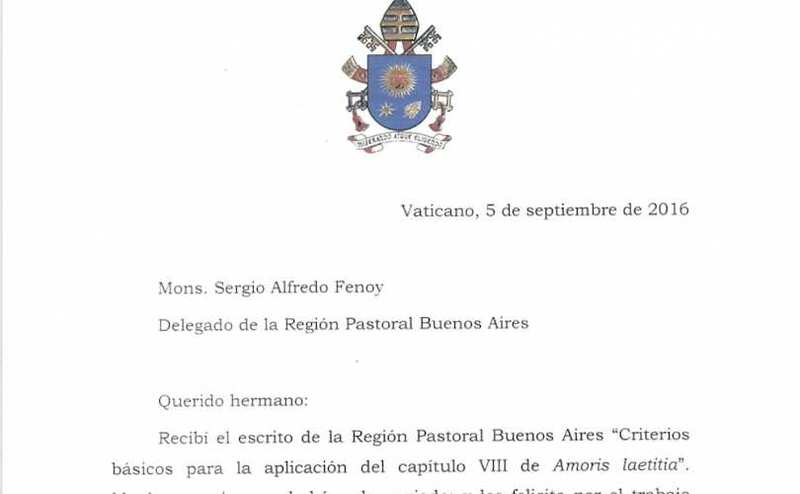 I received the document of the Buenos Aires Pastoral Region entitled “Basic criteria for the implementation of chapter VIII of Amoris laetitia”. Thank you very much for sending it, and let me congratulate you on the work that you have undertaken: a true example of accompaniment of priests…and we all know how necessary it is for a bishop to stay close to his priests and for priests to stay close to their bishop. The bishop’s “neighboring” neighbor is the priest, and the commandment to love your neighbor as yourself begins, for us bishops, precisely with our priests. The document is very good and thoroughly specifies the meaning of chapter VIII of Amoris laetitia. There are no further interpretations. And I am confident that it will do much good. May the Lord reward this effort of pastoral charity. And it is precisely pastoral charity that drives us to go out to meet the strayed, and, once they are found, to initiate a path of acceptance, discernment and reinstatement in the ecclesial community. We know this is tiring, it is “hand-to-hand” pastoral care which cannot be fully addressed with programmatic, organizational or legal measures, even if these are also necessary. It simply entails accepting, accompanying, discerning, reinstating. Out of these four pastoral attitudes the least refined and practised is discernment; and I deem it urgent to include training in personal and community discernment in our Seminaries and Presbyteries. Finally, I would like to recall that Amoris laetitia resulted from the work and prayers of the whole Church, with the mediation of two Synods and the Pope. For this reason, I recommend a full catechesis of the Exhortation, which will, most certainly, contribute towards the growth, consolidation and holiness of the family. Once again, thank you for your work and let me encourage you to carry on studying and teaching Amoris laetitia in the different communities of the dioceses. Please, do not forget to pray and to remind others to pray for me. May Jesus bless you and may the Holy Virgin take care of you. This entry was posted in articolo and tagged #argentina, AmorisLaetitia, popefrancis. Bookmark the permalink.